Gyzel is a Blended Learning Consultant at StratX. She’s in charge of blended learning initiatives and manages and implements new learning platforms and tools. Gyzel brings her rich expertise in producing interactive and high-impact digital content and assets to the e-learning journeys she designs as well as enriching StratX’s learning and development strategy and external digital communications. Since joining the StratX team in 2016, Gyzel has created StratX’s first in-house learning portal, released the very first comprehensive HTML5 e-learning package, launched the first successful 100% remote learning sessions and set up the "StratX recording/video-prod studio" - all helping to shape the digital future of the company. 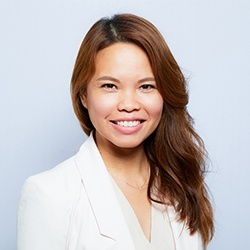 Prior to StratX, Gyzel spent a happy career working for blue chip companies, including LafargeHolcim and Sanofi, where she rolled out large training and development plans and set up learning centres in the Ile de France and Lyon area. Gyzel was able to put her passion for linguistics to good use by running workshops and sessions for more than 500 corporate employees on international mobility, communications, and change management. Driven by her need to deliver the best, Gyzel brings a high level of detail and accuracy to any project she works on. Within the StratX office, Gyzel is known for her curious mind that inspires innovation all the while helping to shake things up. She’s also known for her infectious laugh and enjoys sharing good conversations with colleagues. Gyzel, of Filipino origin, is tricultural and trilingual. She has lived in 3 different continents over the last 3 decades, making France her home for more than 12 years now. When she’s not traveling the world, she spends her time creating moodboards, writing poetry and prose, cooking and dancing. Her passion for fashion has resulted in owning over a hundred pair of shoes but she’s vowed to try her best to not own one more.